A version of this post was originally printed in the Southwest Globe Times on Friday, September 8, 2017. In today’s employment landscape, English proficiency has become essential to economic opportunity. Adult English instruction leads to more productive work and better outcomes for immigrants, their children, our communities and the city. 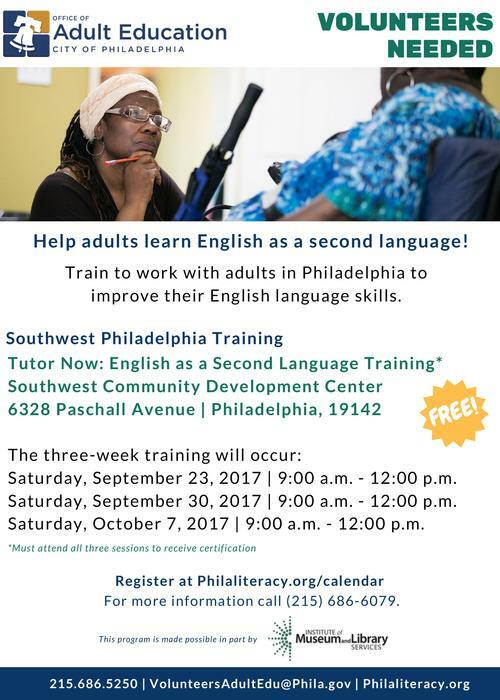 As part of a collaborative initiative that seeks to increase access to high-quality adult-education classes in Southwest Philadelphia, the Office of Adult Education (OAE) is offering a free volunteer-tutor training September 23 through October 7. Every week, Southwest CDC welcomes potential learners to its myPLACESM campus, to take an assessment test and be placed into a nearby class. According to Vanessa Wallace, Adult Education Coordinator at OAE, "We have plenty of willing learners, and need more tutors and classes." This is where you come in! If you are 18 years old, have a high school diploma, and want to help your community, you can register for a free tutor training. You will receive high-quality instruction from an experienced facilitator and will complete online work at home between sessions. It’s a great opportunity to develop and strengthen your own digital skills. What are the benefits of attending the training? In addition to gaining new skills and experiences to put on your résumé and building on existing experience and knowledge, you will building meaningful relationships with learners—thereby supporting other members of the community while strengthening your communication skills and ability to teach others. Whatever your reason, we believe volunteering can transform you and the world around you. The next Tutor Now: English as a Second Language Training takes place on three Saturdays: September 23, September 30, and October 7, from 9:00 a.m. to 12:00 p.m. Attendance at all three sessions is required. The training will be held at Southwest CDC, 6328 Paschall Avenue. Pre-registration is required. 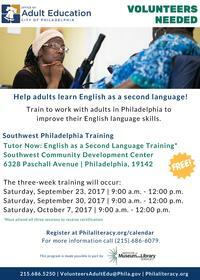 For more information, call us at 215-686-6079, or register at philaliteracy.org/calendar. OAE is part of the Paschalville Partnership, a Free Library-led collaboration of 11 organizations working to transform services for job seekers in Southwest Philadelphia. The training is made possible in part by the Institute of Museum and Library Services. Add a Comment to Help Adult English Language Learners in Your Community by Volunteering to Tutor!